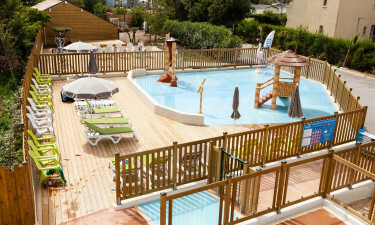 For the ultimate camping holiday that will appeal to both adults and children, a trip to Dunes et Soleil comes highly recommended. Located on the coast in the south of France, this luxury camping site has a peaceful and relaxing atmosphere and has something for everyone to enjoy. Book a fully-equipped mobile home with LUX-camp and make the most of some fabulously affordable deals. With so much to offer and some of the best on-site facilities available, campers will have a memorable and fun-packed holiday. Why choose Dunes et Soleil? No holiday is ever complete without a trip to the beach. Easily accessible from the campsite, the soft sandy beach stretches for 6km and boasts a wonderful array of fun activities and watersports. Parents can sunbathe on one of the many sun-loungers that are available and can rest assured that the children will be able to play and splash about safely as there are lifeguards on duty during the peak season. Take a dip in the sea, soak up the sun or take a walk along the promenade where there are many restaurants, cafes and shops. 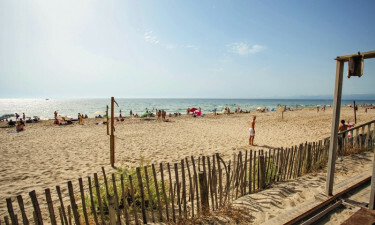 Dunes et Soleil is number one for luxury camping. On-site activities With top-of-the-range facilities available and high quality entertainment, Dunes et Soleil is the perfect choice for camping luxury. Sporting facilities include tennis, table tennis, volleyball, mini golf and horse-riding and there are also plenty of opportunities to try sailing, surfing and angling. Bikes can be hired within the grounds making it easy to venture out and explore the cycle routes that can be found in abundance. For the smaller children, there is a small but fun-packed paddling pool that features an in-pool playground and an exciting waterslide. There is also a fabulous entertainment programme throughout the summer months where both adults and children can participate in competitions and tournaments. Although aimed at campers who want a relaxing break away from the hustle and bustle of everyday life, there is plenty to do to keep active. Pamper yourself With an on-site fitness centre boasting all of the latest exercise equipment, visitors can keep fit whilst enjoying their much-deserved holiday. There is also a sauna and thermal baths available offering the chance to completely relax and unwind. Indulge in a full-body massage or choose one of the many beauty treatments for an added bit of luxury. Boasting some of the best facilities one could expect from such a luxury camping site, there is an on-site restaurant, snack food outlets and a takeaway service available. There is also a bar with an outdoor terraced area for families to enjoy the occasional night out. As Dunes et Soleil is located close to the bustling centre of Marseillan Plage, there are many restaurants, cafes, bars and nightclubs within walking distance of the campsite. Holiday-makers can buy bread within the grounds and there is a convenience store on-site selling camping necessities and groceries. By taking a short walk, campers can browse through the various shops and souvenir stalls that line the seafront.